Unfortunately you cannot safely can fresh peppers without a pressure canner. The extreme heat of a pressure canner is required to kill dangerous bacteria You can, however, pickle peppers in a vinegar-based brine without a pressure canner. 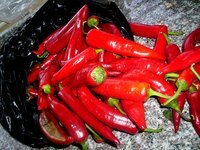 Pickled peppers can be canned using the traditional boiling hot water method. The vinegar provides enough acidity to safely preserve the peppers at a lower temperature. The vinegar brine alters the flavor of the peppers, though not unfavorably, and unopened jars can be stored for up to a year. Gather and wash your peppers. You can combine as many different types of peppers as you want or use one kind at a time. Hot, medium and mild peppers can be mixed together to form a sweet and spicy mixture. Select peppers when they are young, crisp and shiny. Any type of pepper can be used, including chilies, jalapenos, banana peppers, pimiento and habanero. Wash the peppers in cold water and drain. About 1 lb. of peppers will be needed for one pint. Cut large peppers into rings or quarters and leave the smaller peppers whole. Jalapenos and other long skinny peppers are usually cut into rings in order to pack into the jar more easily, however, if you have small whole peppers such as pepperoncini, leave them whole for visual effect. Remove the cores and seeds from the cut peppers. Slash two gashes in the small peppers if left whole. Remove the skin of the peppers. Pepper skins must be removed before pickling or else the pickled peppers will be tough to chew and difficult to cut. To remove the skin, gently heat the peppers in a frying pan, under a broiler or over an outdoor barbecue. Heating the peppers causes the skin to blister and then easily slide off. Peppers usually take between five and eight minutes to blister under any heat source. Wash and sterilize the canning equipment. Wash all jars, rims, lids, tongs and funnels in hot soapy water or run exclusively in the dishwasher. Sterilize the jars by bringing your canning pot, full of water, to a rolling boil. Sterilize the jars in the boiling water for five minutes each. Remove jars and place right-side-up on a clean kitchen towel until ready to use. Place lids and rims inside of a saucepan and cover with boiling water. Let sit until ready. Prepare the brine. In a large stock pot, combine 5 cups vinegar, 1 cup water, 4 tsp. pickling salt, 2 tbsp. sugar, 2 cloves garlic and any other pickling spice you wish to include such as mustard seeds, dill or pearl onions. Bring all ingredients in the pot to a boil and reduce to a simmer for 10 minutes. Pack peppers into the jars. Squeeze as many peppers as will comfortably fit into each jar, making sure to leave 1 inch of space at the top of the jar. Do not overcrowd the peppers to the point where you are forcefully jamming them in the jar. When the peppers are safely in the jars, ladle the hot brine solution directly over the pickles in the jar using a funnel or ladle. Leave a ½-inch space at the top of the jar to accommodate expansion. Wipe the rims of the jars with a damp clean cloth to remove any spilled brine solution and place a soaked lid on top of each jar. Gently screw the ring around the jar only enough to hold the lid into place. A loose ring is necessary in order to allow the air to escape during canning. Lower each lidded jar into the canning pot and boil for 10 minutes. Remove from the water using canning tongs to avoid burns. Let sit right-side-up on the kitchen counter until cool. The tops of the jars should self-seal, making a small popping sound. When cool, test the jars for any lids that did not properly seal. Press the center of the lid; if the lid pops up and down then it did not properly seal and must be stored in the refrigerator. If the lid remains in place, it can be stored for up to a year in the pantry.